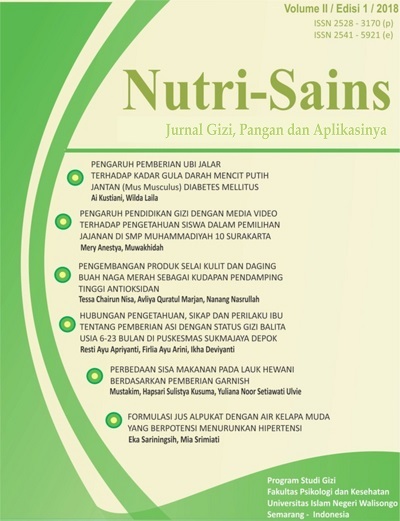 Nutri-Sains: Jurnal Gizi, Pangan dan Aplikasinya is a peer-reviewed, scientific journal published biannually by Department of Nutrition, Faculty of Psychology and Health Sciences, Islamic State University of Walisongo, Semarang. Its scope encompasses original scientific research and case studies in the field of clinical nutritions and dietetics, food services, community nutrition, functional food, nutritional biochemistry, halal aspect of food, regulation and information of food and nutrition. This journal has been indexed by Crossref, therefore, all articles have unique DOI number.